Candidates around the country are floating their names and vying for the dozens of U.S. Attorney jobs. In Virginia, the governor may have a particular interest in the Alexandria position. ALEXANDRIA — Virginia Gov. Timothy M. Kaine’s brother-in-law is among the candidates for U.S. attorney in Alexandria, a key law enforcement job that is supposed to be free of political considerations, legal and political officials said yesterday. 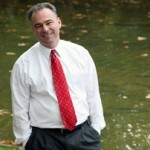 Kaine (D) said he has discussed the position with Dwight C. Holton, an assistant U.S. attorney in Oregon and the brother of Kaine’s wife, Anne Holton. Dwight Holton also is the son of former governor A. Linwood Holton Jr.
Kaine said he referred his brother-in-law to U.S. Sen. James Webb (D-Va.), whose office will help recommend candidates to the incoming administration of President-elect Barack Obama. At least five other current or former prosecutors are candidates for the job, officials said. “All I have done with him is to say there is a process and that process involves getting hold of the senior senator,” Kaine said. The governor added that Holton “is very qualified” and “has had some significant experience” in more than a decade as a federal prosecutor. Posted: 12/24/08 at 2:20 PM under News Story.